Fig. 3. Mutation in the OsGL1-1 (LOC_Os09g25850) gene (a) and corresponding protein sequence (b). Gene model (5’ → 3’) showing location of SNP mutation from KDS-2249D in the 6th on with gray line and box; 5’ and 3’ untranslated regions indicated by open boxes; exons by filled box; introns by lines between boxes; 1,639-bp amplified region for sequencing shown in gray broken lines with forward (F) and reverse (R) primers upon the gene model. 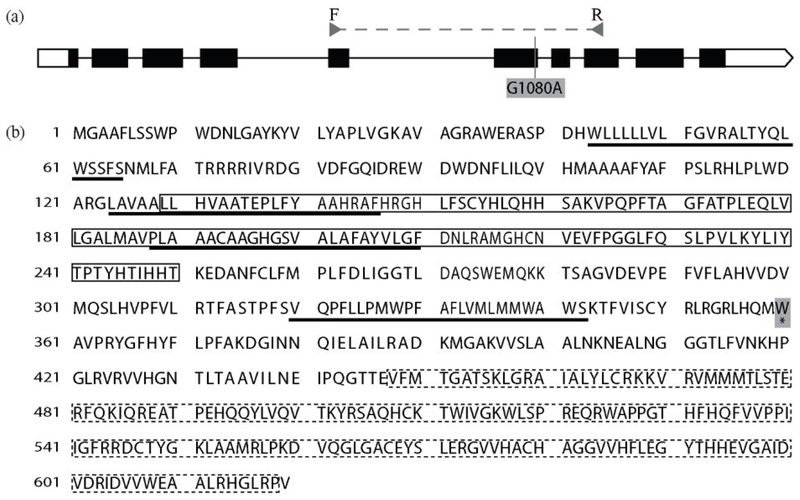 Protein sequence change from W (Tryptophan) to stop codon in KDS-2249D with gray box; Fatty acid hydroxylase superfamily domain (PF04116) in closed rectangle; WAX2 C-terminal domain (PF012076) in dashed rectangle; transmembrane regions indicated with black line.